A Little More "Oomph" Than Our Softi's! A little more firm, a little more lively! Designed to go the extra distance. Medium weight - throw, bounce and kick further. Designed for middle and high schoolers. Our super durable medium-bounce balls now in a 7" size! These firm balls are a little heavier than our Softi-7's, which makes them easier to throw for distance. Best suited for middle and high school aged kids or where a heavier ball is required for throwing. Plus, the sting-free, nearly tear-proof coating means more fun and less worry about wear and tear. Latex-free. About 120 grams each. Set of 6, one in each Spectrum™ color. Certified Latex Free. Non-sting coating is a proprietary polyurethane. Great ball at a good price! 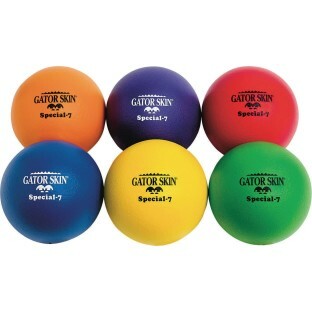 These Gator Skin balls are a great pick for your physical education program. They are made to last and very versatile for teaching many skills. We are using this product at our mission weeks for the various youth groups that are coming to our event. In the evening they have free time and recreation time and they are fully enjoying this added game his summer. Great 7 foam in the u.s. And SS is a standup company that offers 100 guarantee of their products with a 4-yr no questions asked replacement policy. If your ball loses shape or rips they replace it for free minus SH. Will stay a loyal customer for years to come. HIGHLY recommend for adult dodgeball leagues! I use it once a week for dodgeball with friends. Holds up well easy to return if there is a problem. Only had one bad batch in the last 4 years.